Bourton-on-the-Water | Where Angells Tread! The end of the good weather coincides with the end of our holiday. On the way home we stop off in The Cotswolds to break the journey. We’ve parked in the back streets of Bourton because we suspect the centre of the village will be heaving…more later! It’s pouring with rain as we set out and it’s still heavy as we pass through Lower and Upper Slaughter but the weather doesn’t spoil our enjoyment. 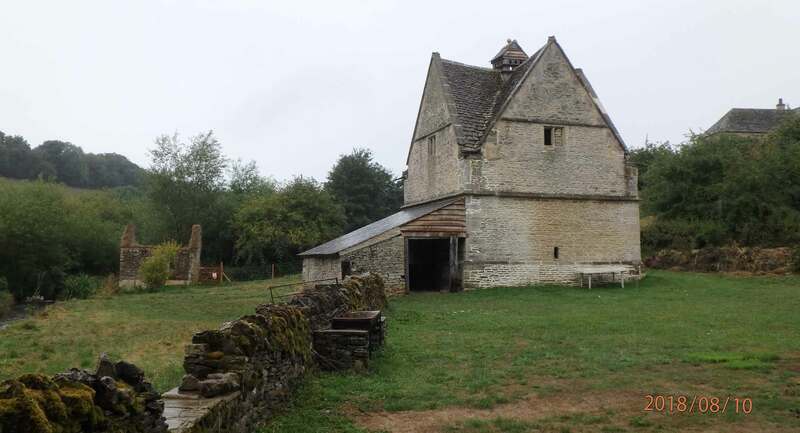 We follow Warden’s Way as far as Naunton and its ancient dovecote before returning to Bourton along the Windrush Way. This part of the world is truly beautiful and down in the valleys it’s peaceful as well. The honey coloured stone is as comforting as chocolate and the only sound is us splashing through the puddles steadily collecting on the paths. This is a great way to finish a lovely holiday…and the weather makes no difference. The peace is abruptly broken as we return to Bourton-on-the-Water. The place is ‘#instagood’! Along the High Street you cannot move for tourists walking around holding out their phones at arms length and taking selfies. To be fair, it is picture-postcard-perfect but it’s all rather spoilt by the crowds. We scuttle through and back to the car. An enjoyable 10.5 mile walk and if you want to see Bourton without the coach loads best get there really early in the morning.